Live Law reported that assesses can now file their income tax returns online without the Aadhaar enrolment number as the Delhi High Court, while providing the relief to two petitioners, asked the Central Board of Direct Taxes to create a platform for people to file returns without Adhaar till the deadline of March 31, 2019 for PAN-Aadhar linkage. A bench of Justice S Ravindra Bhat and Justice A K Chawla allowed petitioners Shreya Sen and one other to file their income tax return online without the Aadhaar. Read the order of the Delhi High court dated 24.07.2018. Similarly, on 24.07.2018, the Madras High Court also allowed 9 petitioners to file their taxes manually without submitting Aadhaar numbers. Bar and Bench reported. Is Aadhaar mandatory? What is it mandatory for? 1. The government has repeatedly asserted that Aadhaar is not mandatory. The Aadhaar enrollment form itself states that Aadhaar is "free and voluntary". 2. While there are various rules/notifications making Aadhaar linking in practice mandatory within fixed deadlines, all these deadlines have been extended, with some notifications nullified. a) For instance, the deadline for linking PAN and Aadhaar has been extended to 31st March 2019 - the relevant CBDT Order was published on LiveLaw. On the other hand, the Income Tax Dept. continues to insist on inclusion of Aadhaar in IT returns - despite the Supreme Court direction in Binoy Visvam making production of or enrollment for Aadhaar for this purpose strictly voluntary. There are, thankfully, “easy” workarounds - see our section below for more details. 3. The Aadhaar scheme is currently under challenge in the Supreme Court of India and its legitimacy itself is in question. The Supreme Court is likely to curb the project: in the absence of any judgment in the case, the matter remains pending and sub judice during which time Aadhaar cannot be mandatory for availing any service or subsidy or benefit, per the SC’s earlier orders. Are you unable to file your Income Tax return without an Aadhaar? For most salaried employees, the process of filing Income Tax returns is fairly “automated” - once the employer supplies the Form 16, you confirm the details align with the TRACES portal record. Subsequently, you use the NetBanking-based tax service feature of your salary account (or other account already used for previous Income Tax returns) to allow you to file “e-verified” returns, usually ITR-1 (aka Sahaj). Since July 2017, the Income Tax Department has required taxpayers to provide their Aadhaar number although the form fiendishly does not indicate that the Aadhaar is mandatory. This is not doubt frustrating, especially if you do not possess an Aadhaar nor have any intention of enrolling for it. We have heard that the simplest hack is based on the recognition that the form does not actually “verify” the authenticity of the Aadhaar - i.e. there is no “Yes/No” authentication being performed, even during the processing of the returns. All that the form does, reportedly, is execute the Verhoeff algorithm to determine if the checksum - the 12th digit of the “Aadhaar” - is valid, thus validating the entire 12-digit number. Therefore, apparently, as long as you enter a twelve digit number that is likely to be an Aadhaar, you are good to go! Last year, several individuals filed their returns using 12 zeroes as their Aadhaar - fact brought up by Senior Advocate Arvind Datar during the Aadhaar hearings. We have been told that the Income Tax Department has wised up and no longer recognizes 12 zeroes as a valid Aadhaar number. There are other numbers (11 1s and a 5, for instance) that are purportedly doing the rounds which are said to serve the purpose just as well. Although many people are using such Verhoeff compliant numbers, we advise verifying through the UIDAI portal whether the Aadhaar actually exists lest you get another person into trouble! There are reportedly other workarounds as well - using a “valid” (but not authentic) enrollment id (rather than Aadhaar), and choosing to verify your returns by post, rather than by electronic means are two. Our recommended methods, however, are other alternatives including (i) waiting for the SC judgment and paying a late filing fee than provide any Aadhaar information whatsoever and (ii) filing a writ petition in the local High Court demanding that the IT Dept allow you to file your returns without an Aadhaar. The latter method has been adopted by various groups across India, among whom are some of the petitioners in the recently concluded Aadhaar hearings. The Right to Food Campaign on 21.06.2018 held a press conference in Ranchi calling out the governance failure in Jharkhand that has lead to a spate of starvation deaths over the past year. Presenting details of 12 starvation deaths, the Campaign noted that 7 of these cases were directly related to Aadhaar-enabled exclusion. Reports indicate that three persons have died during the month of June. The reports highlight the fact that contrary to all the claims of enhancing efficiency in welfare, Aadhaar has no role to play in facilitating inclusion, For instance, Chintaman Malhar, 40, died of starvation as he had no food to eat in his makeshift shelter. His son Videsh claimed that his father was hungry for the last few days and collapsed while repairing the hut in the scorching heat on Thursday. He alleged that in spite of having Aadhar cards, they have not been issued ration card so far. For years, two successive governments at the center have portrayed Aadhaar as important to improve inclusion into government schemes. But simply having an Aadhaar does not lead to any greater inclusion as several schemes continue to have own quotas and cut-offs. While the requirement to have an Aadhaar for food schemes, and to give biometric authentication each time adds more hoops to cross to get grains and pensions on time. On 13th July a protest was organised at the Jharkhand State Bhawan, New Delhi by the Right to Food Campaign. The Campaign submitted a memorandum to the resident commissioner which highlighted the ongoing issues related to the Public Distribution System in Jharkhand and the various attacks on the Right to Life. The memorandum also demanded the delinking of Aadhaar from all public services. The government’s push to include Aadhaar in every single system continues with the release of a consultation paper on the ‘National Health Stack’. The dangers of pushing an insecure, leaky, vulnerable, centralised identity system onto the already under-served and broken public healthcare system, have not been examined by the authors of the consultation paper. The proposed National Health Stack might have serious and far-reaching consequences for the security and privacy of sensitive health information and data. “Significantly, the National Health Stack is designed and developed on the same lines as the Aadhaar-based India Stack — a controversial FinTech system for delivery of services, such as digital payments.” - Praneta Jha of Newsclick writes National Health Stack: An Architecture Of Doom For Public, Data For Private Profit - The proposed Stack, a digital infrastructure to subsume all medical and healthcare activities in India, seeks to turn the entire health sector into a market (run by private players obviously) — while ensuring those at the edge actually fall off. Affected individuals have been continuously approaching the courts praying for relief against Aadhaar induced problems. On 9th May 2018, the Rajasthan High Court has ruled that Aadhaar is not mandatory. In its order, the HC directed Rajasthan Public Service Commission (RPSC) to not insist on Aadhaar for submission of online application of the petitioners of the Rajasthan Administrative Service and Allied Service 2018-19. The petitioners said the Aadhaar card scheme is purely voluntary and it cannot be made mandatory and prayed that the commission be directed to withdraw its press notification making registration through mobile number registered with Aadhaar mandatory. On 8th June 2018, the Delhi High Court directed AIIMS, country’s premier health institution, to compensate an aspiring medical student, who was not allowed to sit in this year’s MBBS entrance examination just because the QR Code in his Aadhar Card could not be scanned at the examination center. Petitioner had uploaded the details of his Aadhaar Card as his I.D.Proof, which was verified by AIIMS and admit card with Aadhaar number was issued. 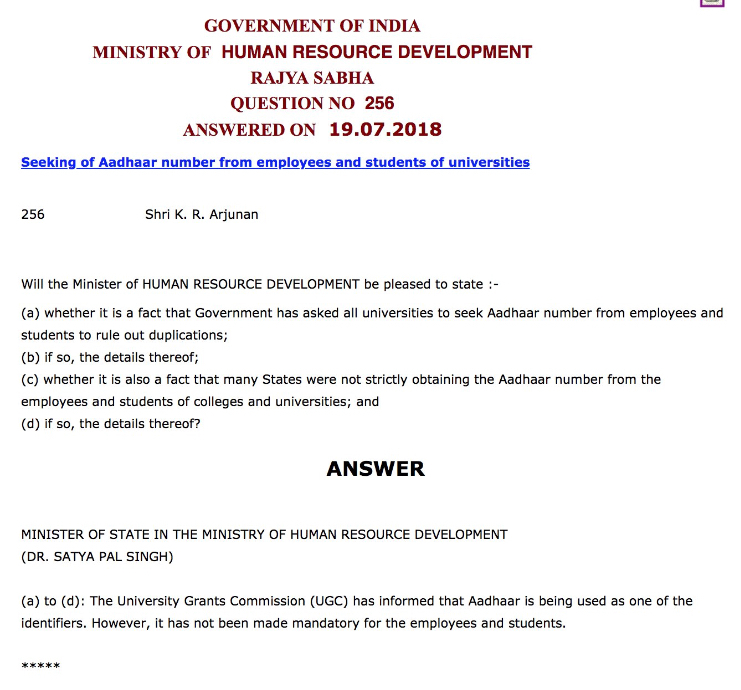 However on the day of the exam the student was not allowed to take the exam for the mere reason that his aadhaar card was not being scanned on their mobile phone. On 31st May 2018, Delhi’s Tis Hazari Court clarified that Aadhaar is not mandatory for litigants. Delhi-based Mohan Bhadana had filed an application under RTI with the Public Information Officer of Tis Hazari Court seeking copy of the notification or directions making Aadhaar mandatory before District Courts in Delhi or the Delhi High Court. Aadhaar-linked DBT has been creating havoc everywhere. There are reports that payments have been delayed upto a year or even more in some cases for payments related to NREGA, pension, rations etc. In Pune, the aadhaar-linked disbursement of salary from banks has been full of glitches, and many anganwadi workers have not been paid honorarium for several months. Activists have alleged that an anganwadi worker committed suicide because she was deprived of honorarium for six months as her biometrics did not match. In Karnataka, Prajwal Bhat has reported on the issues faced by people in rural Karnataka - With their ration linked to Aadhaar, residents say they’ve had to forego their monthly staples – the fingerprints don’t match, or there isn’t enough connectivity to process their biometrics. Of the 1.2 crore ration cards linked with the biometrics database in Karnataka, nearly 99 lakh cards recorded transactions in February 2018. Of these, fingerprint authentication did not work for over 18.6 lakh cards, almost one in five families in the state. We would like to remind readers of our own analysis which found a large percentage of authentication failure. The Digital Identity Research Initiative (DIRI), hosted at the Indian School of Business (ISB) and funded by Omidyar Network (ON) recently released a data brief on ABBA in the PDS in Delhi. Based on an analysis of transaction logs received from PoS devices (data which is not available in the public domain), they find that during the Month of March 2018, the authentication failure rate was 1.3%. They note that was predominantly due to insufficient capacity of Aadhaar servers and not due to failure in biometric authentication per-se. In a manner characteristic of research funded by ON (see State of Aadhaar by IDinsight), the framing of the findings attempt to divert from the real issue that irrespective of which specific ‘‘fragile technologies’ of Aadhaar broke down, it is resulting in significant exclusion. Further, the pro-Aadhaar lobby (see here, here and here) are attempting to project these findings (fraught with framing effects) as innovative and illuminating. This is surprising given that Aadhaar critics have highlighted the role that disruptions relating to remote Aadhaar servers can lead to exclusions - see articles and studies highlighting this very aspect here, here and here. The Financial Express reported on 20.07.2018 that The National Payments Corporation of India (NPCI) has told banks to discontinue Aadhaar-based payments through the Unified Payments Interface (UPI) and Immediate Payment System (IMPS) channels. In Jharkhand, the Congress President wrote to the Union Food Minister to withdraw the ‘DBT for food subsidy’ pilot in Nagri block of Jharkhand and compensate all households that are denied their grain entitlement due to this pilot. The Congress State President also requested the Minister to remove the mandatory integration of Public Distribution System with Aadhaar and the requirement of Aadhaar-based biometric authentication for accessing rations. While the state units of national parties are cognizant of the reality of errors of Aadhaar, it is time the national offices of these parties also take a firm stand against making citizen’s rights contingent on the probability of an Aadhaar authentication. There has been a severe lack of any oversight mechanism of UIDAI, and it is no wonder that UIDAI has become a law unto itself - giving directions to other national agencies like the RBI, TRAI and state governments in matters where it may not have jurisdiction or competence. The Aadhaar Act, 2016 calls for various reports to be submitted annually before the Central Govt and Parliament. We wonder where these annual reports are and what our parliamentarians have to say about them. In April this year, new rules were notified by MEITY wherein UIDAI needs to submit various detailed reports quarterly and annually. We certainly hope that these new sets of rules are not ignored by UIDAI and that these reports are proactively made available to the people in the interests of transparency and accountability. 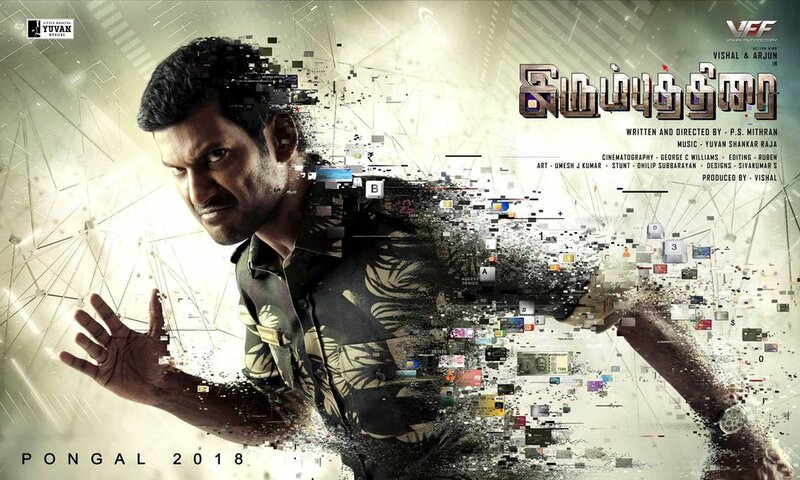 The Tamil film Irumbu Thurai decided to tackle the issues of Aadhar and “Digital India” and unsurprisingly met with stiff resistance from a BJP-associated outfit which protested against the dialogues and scenes related to Aadhaar and Digital India. A PIL filed against release of the film was dismissed by the Bombay High Court a day before the release. Once more UIDAI has been found to be deficient in the “services” it provides, and its accountability - in a shocking incident, the Deccan Chronicle reported that nearly 5000 Aadhar card were been found in a scrap dealer's shop in Jaipur. With the illegal mandatory use of Aadhaar in all walks of life, it can be debilitating for citizens’ Aadhaar cards to go missing. Imagine the plight of the people who were waiting to receive their Aadhaar card - what recourse do they have? Often, in rural India, especially, when the residents do not receive their Aadhaar “cards” on time, they try to enroll again, but are rejected each time, as their biometrics are already in the database. This leaves them without any redressal and cut-off from essential services.